One of my oldest and most beloved cookbooks is Madhur Jaffrey’s Indian Cookery which Bethany and I must have bought in London back in the mid eighties. The pages of favorite recipes are stained with the rich colors of Indian spices and splattered with oil. 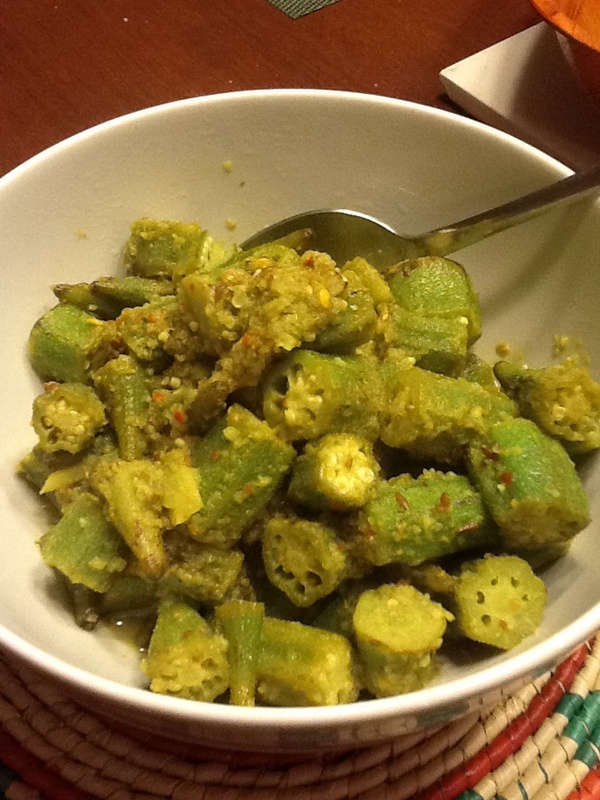 Here is her lovely way to prepare okra, or as they were traditionally known in Britain, ladies fingers (yuck) and, much more evocatively called by Jaffrey, bhindi. 2 tsp of ground cumin. 4 tbsp of vegetable oil. Cut the okra into 3/4 inch rounds. Put the garlic and chilli in a blender with 3 tsp of water. Blend to a paste. Add the ground cumin, coriander, and turmeric, blend briefly to mix. Heat the oil to medium in a skillet. When hot, add the whole cumin seeds. As soon as the seeds begin to sizzle, turn the heat down and add the spice paste. Stir and fry for a minute. Add the okra, salt, sugar and lemon juice and the rest of the water. Stir to mix and bring to a gentle simmer. Cover tightly and cook until the okra is tender, no more than ten minutes.